G&S Printing is your source for all your Social Invitations and Announcements. We specialize in Wedding Invitations, Anniversary Invitations, other Social Invitations, Thank You notes, Graduation Announcements, and carry a full line of Wedding Accessories. View our extensive on-line invitation catalog here. 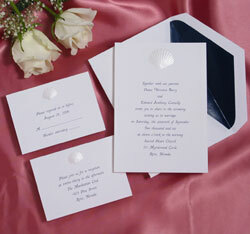 To see one of our six invitation books, call us today and we will bring one to you to review. Being able to see and feel the products in our books will help make your decisions easier. Please call us to review the details of your order before placing an order online. Call G&S Printing today – 518-232-2465 - for details on all our Wedding Invitations and Social Invitations – and let us help you make your special day the best it can be!